People in Colorado still remember John Hickenlooper’s crack after the state legalized marijuana, a move he opposed: “Don’t break out the Cheetos or Goldfish too quickly.” But Mr. Hickenlooper, the governor at the time of the 2012 initiative allowing recreational use of cannabis, eventually changed his mind. He acknowledged that fears of increased use by children did not materialize, and he boasted of the tax revenues for social programs that regulated sales delivered. Entering the Democratic presidential race this month, Mr. Hickenlooper joined a field already jammed with pro-legalization candidates, a reflection of swiftly changing public opinion since Colorado became the first of 10 states with legal recreational marijuana. The issue today is a pillar of progressive politics, but not because of graying hippies who like their Rocky Mountain High. Rather, for many Democrats, legalization has become a litmus test for candidates’ commitment to equal treatment for all races in policing and criminal justice as well as fighting economic inequality. Cannabis drinks are hitting the global market, promising anxiety reduction, pain relief and better sleep. One thing none of them tout is taste. “Like a barnyard,” Ron Silver, owner of Bubby’s restaurant in New York, says of the cannabis oil used to make weed-infused drinks. The self-described cannabis advocate says he started cooking with hemp oil about five years ago and was initially dismayed by the results. “The oil tastes terrible, and it floats,” he said. 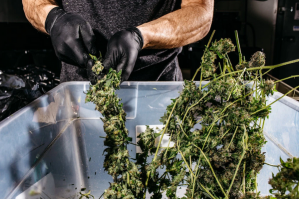 “It’s very grassy and very funky.” He began tinkering with ways to reduce the intensity of the flavor and is confident enough in the results that he recently launched Azuca, a company that sells cannabis-infused sweeteners. Obama Let Hezbollah Run Cocaine Into the U.S.